Will the Neocons Eat French Fries Once Again? To bolster its response to the ISIL threat, the U.S. has been steadily assembling an international coalition to degrade and eventually destroy the terrorist group. The State Department says that "over 50 countries and organizations have already contributed in various capacities to the effort to combat ISIL in Iraq, the region and beyond" in one way or another and that more than a dozen countries have contributed to the military effort, either by providing arms, equipment, training, or advising. One of the countries that is part of this coalition -- limited and conditional as it may be -- is France. France, however, is more than just a member of a hesitant, albeit growing coalition. It is the first nation to concretely make good on its promise to fight ISIL by joining the U.S. in launching military air strikes against ISIL terrorists in Iraq. On Friday, two French Rafale fighter aircraft armed with laser-guided bombs launched an air strike against ISIL and "entirely destroyed" an Islamic State munitions depot and killed dozens of ISIS fighters. This morning at 9:40, our Rafale planes carried out a first strike against a logistics depot of the terrorist organization Daesh [the Arabic acronym for Islamic State] in north-east Iraq. The objective was hit and completely destroyed. The statement added, "Other operations will follow in the coming days." 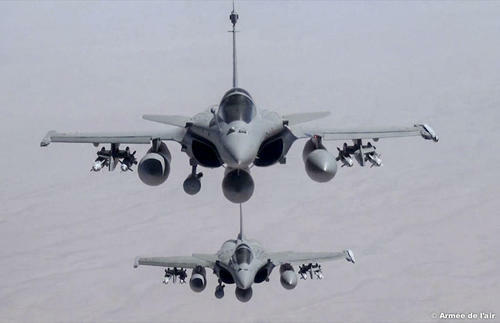 French officials said Friday's mission involved two Rafale fighter jets, a supply plane and a Navy reconnaissance plane. Four air strikes were carried out in the space of half an hour, destroying a storage facility containing vehicles, arms and fuel, a spokesman for Defense Minister Jean-Yves LeDrian said. Gen. Martin Dempsey, Chairman of the Joint Chiefs of Staff, was in France for meetings with his counterpart, Gen. Pierre de Villiers. He also visited an American military cemetery in Normandy, where so many Americans who took part in the Normandy invasion and follow-on military operations are buried. When told of the attack, Dempsey praised France's action: "The French were our very first ally and they are there again for us...It just reminds me why these relationships really matter." President Obama had also praised France for its plans to join the U.S. in conducting air strikes against ISIL in Iraq. Obama also referred to France as being "one of US' oldest and closest allies..." "We are pleased that French and American service members will once again work together on behalf of our shared security and our shared values," the President said. More recently, under the Obama administration, France participated in the NATO-led airstrikes in Libya and, just last year, France was also ready and willing to join the U.S. in possible military action against President Bashar Assad in Syria. Obama's and Dempsey's comments are a far cry from what Bush administration officials at the highest levels were saying about France during the early days of the Iraq War disaster when France made the wise decision to spurn Bush's invitation to participate in his misconceived, misguided and mismanaged invasion and occupation of Iraq -- a war about which, even today, retired French Gen. Vincent Desportes says, "[It] was a stupidity." They are indeed a very far cry from the anti-French sentiment -- oftentimes-vile abuse -- that was rampant in Conservative circles in the wake of France's refusal to participate in the Iraq War. The anti-French hysteria ranged from silly Republican Congressional, knee-jerk reactions, such as renaming french fries to "freedom fries," to more serious accusations and ad hominem attacks. In September 2003, even Thomas Friedman wrote an opinion piece in the New York Times titled "Our War With France" where he claims, "France is not just our annoying ally. It is not just our jealous rival. France is becoming our enemy," and where he concludes, from France's lack of cooperation in the Iraq War, that: "France wants America to fail in Iraq;" that "France wants America to sink in a quagmire there in the crazy hope that a weakened U.S. will pave the way for France to assume its 'rightful' place as America's equal, if not superior, in shaping world affairs." Just think of the pickle neocons find themselves in today. Here is a nation they maligned so much a decade ago which now is doing for President Obama what it refused to do for Bush -- join in what neocons like to do best: bomb, bomb, bomb. Should the neocons be grateful to the French? Will their love of war trump their antipathy towards the French and, more important, their hate of Obama? Will they start eating french fries again?